THE STORY - Belle (Emma Watson), a bright, beautiful and independent young woman, is taken prisoner by a beast (Dan Stevens) in its castle. Despite her fears, she befriends the castle's enchanted staff and learns to look beyond the beast's hideous exterior, allowing her to recognize the kind heart and soul of the true prince that hides on the inside. THE GOOD - Luke Evans and Josh Gad are perfect as Gaston & LeFou and their main number "Gaston" is the best in the whole film. Excellent music by Alan Menken and beautiful costume design by Jacqueline Durran. THE BAD - Bill Condon cannot find the right tone or pacing for the film as he sticks too close to the original 1991 film, failing to carve out a new identity for this live-action remake. ​The 1991 version of "Beauty & The Beast" is one of my favorite animated films of all time. I would venture to say it's perfect. The 2017 live-action remake of "Beauty & The Beast" is a mixed bag at best. For every great musical number, there is a terrible editing or directorial choice that bogs down the entire film, forcing us to make comparisons to the original animated classic. It certainly does not help that director Bill Condon sticks so closely to the 1991 film in terms of tone, dialogue, and iconic moments. Without the ability to carve a unique identity for itself as something like "The Jungle Book" was able to do, "Beauty & The Beast" ends up becoming a pale imitation of its vastly superior animated counterpart. Belle (Emma Watson) is a peculiar young woman living in a small village in France with her widowed father Maurice (Kevin Kline). She is constantly harassed by the brutish Gaston (Luke Evans) into marrying him, even though Gaston's trusted sidekick LeFou (Josh Gad) has his own infatuations with the hulking specimen. Maurice leaves the village and gets lost, finding himself in an enchanted castle that holds a terrible curse over it and all those who live there. 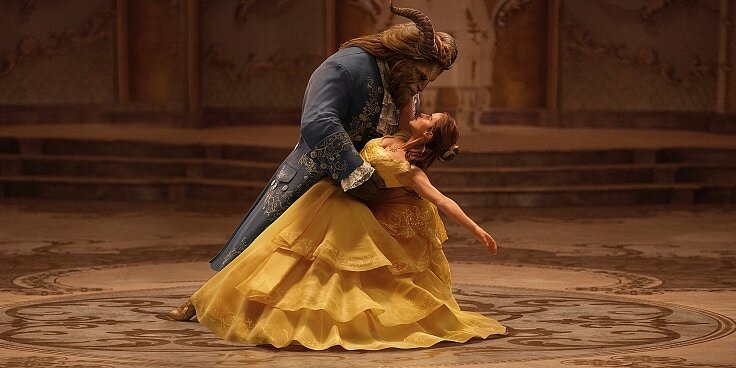 Belle finds her father in captivity from the master of the castle known as Beast (Dan Stevens), who is a hairy monster that is just as cruel and he is wild. Belle agrees to trade places with her father as the Beast's prisoner and ends up befriending the castle's many fantastical servants, now cursed as inanimate objects such as the French candlestick Lumiere (Ewan McGregor), a clock known as Cogsworth (Ian McKellen), a mother teapot named Mrs. Pots (Emma Thompson) to her son Chip (Nathan Mack). All of the castle's servants befriend Belle in hopes that she will be the one to break the castle's curse but in order to do that, the Beast and she must fall in love before the last petal of a magical rose falls. Let's start off with the good stuff first. Luke Evans and Josh Gad are absolutely flawless as Gaston and LeFou. Their main musical number "Gaston" is the purest fun one could have watching the movie, with or without the whole controversial "gay" subplot added involving LeFou's infatuation with Gaston. Other than those two, Kevin Kline radiates a different style of charm in his warm performance as Maurice. There are some decent animated effects for the objects which occupy the Beast's castle. Everyone from Lumiere to Cogsworth, to Mrs. Pots, feel like they have real personalities through their animation, something that is truly important as the film reaches its final act. The song "Be Our Guest" benefits the most from this in all of its grandeur and colorful excitement. Other technical efforts such as the music by Alan Menken and costume design by Jacqueline Durran are all first rate and help to add to the magic and wonder that is this timeless story. Now let's get to the mixed bag of topics surrounding "Beauty And The Beast." I want to first bring attention to the production design by Sarah Greenwood. Interiors look detailed and absolutely fantastic. There are some echoes of the Broadway musical here in terms of how the space is built and utilized by the actors but that decision also has a negative impact on how the exteriors look. The small French village looks too much like it was shot on a backlot as it feels enclosed and claustrophobic (You never really see the sky unless it is a CGI shot). Next, I move over to the new musical numbers added to the film. I honestly did not have a problem with any of them, as I felt they added to the story ("How Does A Moment Last Forever" deals with Belle's mother) or added to the character development. "Evermore" by Josh Groban might be my favorite track to listen to on its own, separate from the film and the reason for this has to do with how much the song does not fit Dan Steven's digitally altered voice performance as Beast. Rough and deep in tone, when Beast finally has his own musical number it does not translate nearly as well as one would hope. Speaking of which, I mentioned earlier how the animated effects of the inanimate objects within the castle were well done but one thing that never truly clicks is Beast's own GCI'd face. Despite Dan Steven's solid voiceover performance, I could not help but wonder multiple times throughout if practical makeup effects would have been the better call here in terms of bringing this character fully to life. Emma Watson does her best but is the victim of being too recognizable a face to escape the high expectations which audience members and other critics will put on her to make this role her own through her acting and more importantly, singing ability, which in my opinion she does not excel at. However, Emma Thompson and Ewan McGregor certainly do excel in their main musical numbers despite the later putting on an appalling French accent. And now we come to the really bad stuff. Unfortunately, and for reasons which I cannot fully comprehend, "Beauty And The Beast" somehow looks like it was shot and edited like a made for TV movie. Right away, from the film's first opening moments we are thrust into the narrative with no warning or guided sense of ease, as we witness a horrible voiceover flashback with quick cuts that don't allow for the magical moments to settle. At two hours and nine minutes long, you would be surprised to find out how quickly edited this film is and how it destroys the moments that are meant to resonate the most. I have to put the blame on Bill Condon for not finding the right pace for his film and also for (More criminally), not finding the right tone. Campy acting, terribly placed one-liners at the end of each song and other unsuccessful bits of humor don't help to add anything to the 1991 original. For a live action remake of the 1991 original, even though it deals with fantastical elements, some story beats from the original don't translate well to live action. For example, the horse Phillipe, does not behave as any horse in the real world would and if the Beast is so concerned with the magical rose being damaged, why would he leave it outside in the open where the weather could possibly do harm to it? These unrealistic scenarios, while trying to stay true to the Disney original, begs to question why a live-action remake was needed in the first place if it was going to be, for the most part, a near carbon-copy? "Beauty And The Beast" has some good things going for it but also has more bad than good here, leading it to be called possibly the worst in Disney's latest line of live-action remakes. Of all the films they have put out so far, this one hurts the most as the 1991 "Beauty And The Beast" is a true classic and so iconic that it even found life on Broadway in a successful stage adaptation. This 2017 version would have done well to take more elements from that real-life version than the animated film as many elements don't translate well to screen in live-action form. For everything that the film does well, there is something else to set it off balance resulting in a film that I will not be revisiting anytime soon. The 1991 version was so good that it even managed to become the first animated film to be nominated for the Best Picture Oscar. Bill Condon's 2017 remake has no such chances and will barely even struggle to get a re-watch out of me over the classic animated version.